Researchers have managed to restore light perception to mice through gene therapy, by inserting algae genes into the retina. The treatment has succeeded in restoring the ability to sense light and dark to blind mice, and clinical trials in humans could begin in as little as two years. It is estimated that over 15 million people worldwide suffer from one form or another of blindness, like the most common retinitis pigmentosa (RP) or age-related macular degeneration (AMD). Most affections relate to the photoreceptors in the retina, which transform light hitting the eye into electrical impulses, this way preventing the brain from receiving image information. Scientists based their very creative gene therapy on the Channelrhodopsin-2 (ChR2), a photosensitive protein used by unicellular algae to help them move towards light, which they injected into the mice retina via a “domesticated” virus. 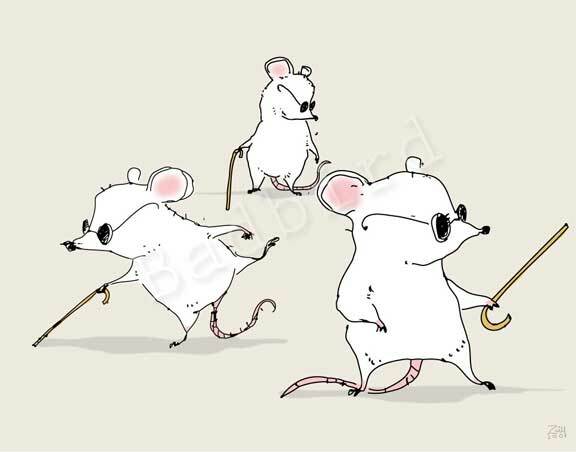 The procedure was conducted on three groups of mice: one with normal vision, and two groups of mouse strains that naturally become blind with age in a similar way to people with RP and AMD. One of hte blind groups was subjected to gene therapy. After dissection, treated mice reveled in their retinas that the ChR2 protein was being indeed expressed by the bipolar cells. The biggest revealing data which poised researchers to believe their on the right track is their maze experiment in with blind and treated mice alike were put in the middle of a 6 corridor maze, with only one possible exit which was lighten. Scientist found that treated mice managed to find the exit on average 2.5 times faster than untreated blind mice. “It’s a good paper, and it’s clear that they are heading towards a clinical trial with the information they are gathering,” says Pete Coffey of the department of ophthalmology at University College London. But he points out that although there is a statistical difference between the performance of the treated and untreated mice, that difference is small. Even though this particular research, published in Molecular Therapy, might only render human patients to experience light/dark discrimination, it’s still some sort of progress, different from current non-commercial stem cell treatments, and in my opinion provides a definite step forward to curing what’s maybe one of the most tragic, yet common, affections of humanity.